I’m embarrassed to say it’s been a month since my last post. A productive and very fruitful month, and all the same I’m frustrated that I haven’t been able to post on all the amazing programs and women I’ve been in contact with recently. My headspace has been consumed with selecting a “big school” for Master 4-and-a-bit… which for us means deciding between living full time on the farm in the country, or alternately in the city… decisions, decisions, decisions! And as I discovered today at the launch of a new toolkit on Genderwise Philanthropy, I’m not alone in making those important decisions on behalf of my little family. 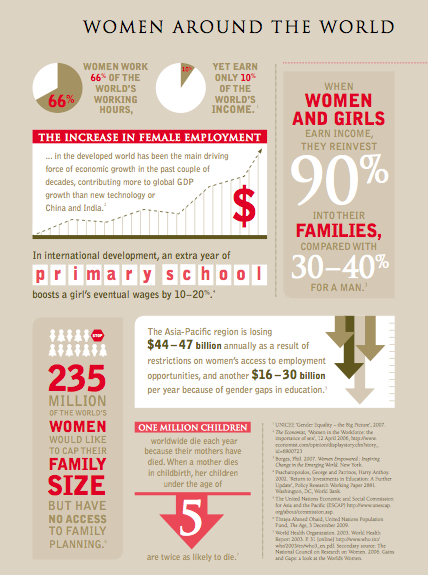 Throughout the world, it’s women who have the greatest influence on the education and life opportunities of their children, and that’s why the Australian Women’s Donor Network has launched this new tool kit aimed at focusing all Australians on how to use philanthropy as a tool in strengthening society – by investing specifically in women and girls. And considering this, the Gender-Wise Philanthropy Guide maps out a step-by-step guide for philanthropists in how to review and apply a gender lens to their giving. The guide was officially launched today by Her Excellency Professor Marie Bashir AC CVO, the Governor of New South Wales. In a very moving speech, Her Excellency spoke about her own personal and professional experiences and how they have guided her perceptions that investing in women really does pay the greatest dividend for any community. She shared stories from her career as a psychiatrist working with at risk children and adolescents, including those in the most remote indigenous communities, and of her lifelong commitment to securing the best possible future for all children. “With a population of just 22.5 million, there’s not one child to be spared. We need every child to reach his or her full potential”, implored Her Excellency. And of course she’s right. More than 66 per cent of children seeking refuge from homelessness were in the care of a woman who was the victim of domestic violence. Women are two and a half times as likely to live in poverty in old age, compared with men. These are just some of the reasons why we need to invest in programs that invest specifically in women and girls, and why we should apply a gender lens in our giving practices. And if you’re interested in doing just that, you can find out more from Australian Women’s Donor Network. It’s certainly got me thinking about what more I could do…. and I wonder what are your thoughts on genderwise philanthropy? ?